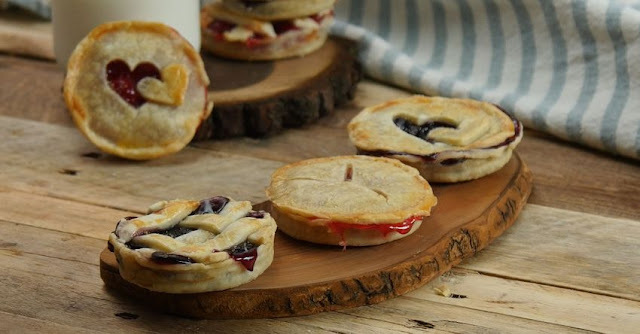 Have you ever seen anything cuter than these Mason Jar Lid Pies? Not only are they adorable, but it's a genius idea for making snack-sized pies that you can take on-the-go. Give this tasty recipe a try and don't forget to share it with other pie lovers in your life! Place your pie crusts on a lightly floured surface. Using a knife, trace around the circumference of your mason jar lids and rings (make sure the pie crust circles are a bit larger than the lids and rings). Place the larger pie crust circle inside your lids (make sure the silicon part of the lid is facing down). Spoon in some pie filling and top with the smaller piece of pie crust. Make sure to cut some slits in the crust so that steam can escape. Use a fork to press the edges of the crust together and brush with egg wash.
Place your mini pies on a baking sheet covered in parchment paper. You can sprinkle the tops of the pies with turbinado sugar if you like. Bake for 25 minutes. Remove from oven and let cool for 5-10 minutes before eating. Enjoy! 0 Response to "Use Your Mason Jar Lids to Make This Cute and Delicious Dessert"